Raymond Irvine with his Charolais cow which stood show champion of champions. 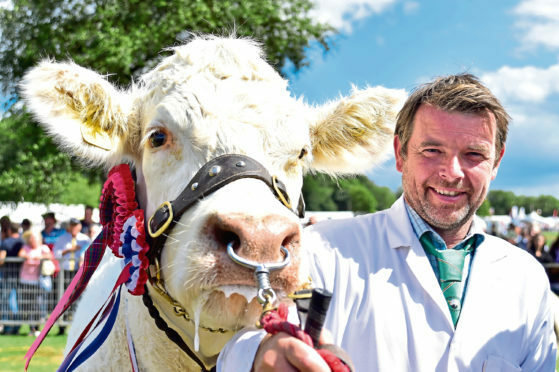 It was the Charolais cow from father and son duo John and Raymond Irvine of Inverlochy, Tomintoul, which took the supreme champion of champions title at a gloriously sunny Turriff Show yesterday. The pick of Fife-based judge, Ronnie Black of Collessie, was Inverlochy Ingris. She is a home-bred five-year-old cow by the £11,000 Maerdy Eryr and out of Inverlochy Babe. She stood reserve at the Royal Highland Show in June and is due to calf shortly to Kilbline Instigator. For the reserve overall show champion of champions, Mr Black tapped out the ridden coloured horse champion – Melanie Riley’s Lammerside Mr Darcy. This 12-year-old traditional cob was bred by Gilly Chippendale and is now ridden by Faith Riley. The pairing had previously won the junior showmanship and Howe’s Show of Colours. Meanwhile, the task of judging the overall cattle championship fell to Archie MacGregor of Allanfauld, Kilsyth. And after tapping out the Charolais as his champion, it was the Simmental cow from Stewart Stronach and family, which took the reserve honours. Islavale Emerald was reserve beef interbreed champion. This was Islavale Emerald, a rising five-year-old cow by Woodhall Walker and out of Islavale Virginia. She was on her first show outing and was shown with a heifer calf at foot. The cattle group of three and pairs competition were judged by David Brown of United Auctions, and in both competitions, it was Blair Duffton and Rebecca Stuart’s commercials which led the way. Mr Brown said: “They were a very sweet group, very unified and well balanced”. Over in the sheep rings the supreme championship was judged by Allan Wight of Midlock, Abington. He chose the Texel from Willie Knox and sons, Graeme and Andrew, to take the top honours. The overall sheep winner from the Knox family. The overall winner was a home-bred two-crop ewe by Cowal Vogue and out of a ewe by Strathbogie Smoky Blue. Mr Wight’s reserve pick was the Charollais ewe from Willie and Carole Ingram, and sons Gregor and Bruce of Logie Durno. The ewe, named Loanhead Riverdance, is a daughter of Crogham Hannibal and out of Riverdale Iris. The Logie Durno Charollais team was also victorious in the interbreed pairs competition, taking top honours. The winning pair was the show reserve interbreed champion, alongside shearling ram Canahars Superstar. Simmental – Stewart Stronach with Islavale Emerald, a rising five-year-old cow by Woodhall Walker. On first outing and shown with a heifer calf at foot by Curaheen Giant. 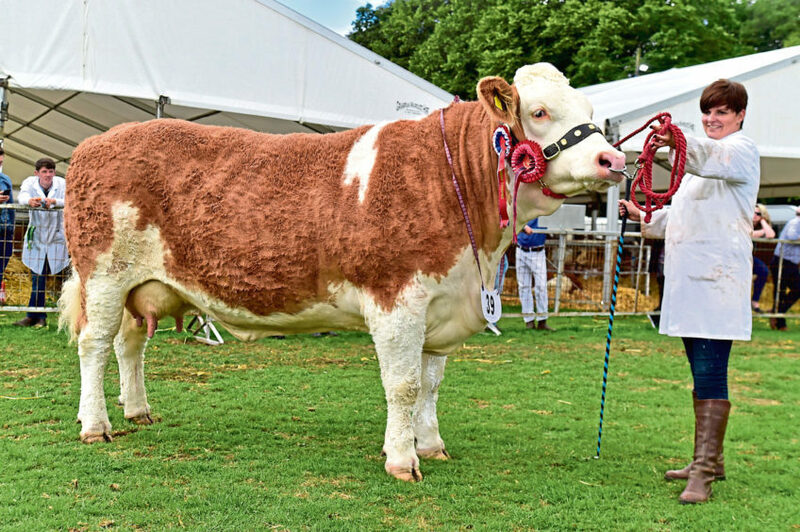 Reserve – Gerald and Morag Smith, Drumsleed, Fordoun, with Drumsleed Farina, a four-year-old cow by Clonagh Buckarooney. Reserve at Fettercairn and shown with her heifer calf at foot by Lopemede Grenadier. Shorthorn – Smallburn Farms, Plewlands, Duffus, Elgin, with Smallburn Jethro, a three-year-old bull by Lowther Emblem. Champion at the Highland and Black Isle. Reserve – Smallburn Farms with two-year-old heifer Smallburn Kylie, by Coldrochie Front Rank. Reserve at Black Isle. Aberdeen-Angus – AJR Farms, Milton of Collieston, Ellon, with Kincardine Castle Flying Starlet, an eight-year-old cow by the £30,000 Netherton Figo. Bought privately from Kincardine Castle last October. Shown by Andrew and James Reid. Reserve – Sandy and Kay Rhind, Newton of Struthers, Kinloss, with two-year-old bull Newton-Struthers Evo, by Retanach Panzer. Reserve at Nairn and destined for Stirling Bull Sales in October. Charolais – John and Raymond Irvine, Inverlochy, Tomintoul, with Inverlochy Ingris, a home-bred five-year-old cow by the £11,000 Maerdy Eryr. Reserve at the Highland. Reserve – Garry Paterson and Blair Duffton of Keith and Huntly with three-year-old heifer, Battleford Lola. By Lochend Apache, she was bought in Dungannon for 8,000gn. Shown with heifer calf at foot by Blelack Immaculate. Interbreed champion at New Deer, Echt champion and in winning group at the Highland. Limousin – Aileen Ritchie, Tamala, Burnside, Whitecairns, with Ritchies Meryl, a home-bred heifer by Sympa. Interbreed champion at Angus, and champion at Fettercairn, New Deer and Banchory. Reserve – Michael Robertson, Fodderletter Farms, Tomintoul, with Cornsay Nova, a Lodge Hamlet-sired 18-month-old heifer. British Blonde – Graeme Anderson, Beltie Cottage, Glassel, with Glassel Neymar, a home-bred yearling bull by Strathisla Glen. Champion at Echt and reserve at Banchory. Reserve – Alison Watt, Birkenburn, Keith, with Strathisla Dawn, a 10-year-old cow by Druk Lance. Champion at New Deer and Banchory, and reserve at Echt. Highland – John and Jenne Singer, Laurencekirk, with three-year-old heifer Ailsa Emma Dhubh of Kintore Castle, by Uallach Dubh 6 of Pollock. Champion at East Club, Angus, Alyth, Echt and Banchory. Reserve – Stuart and Michelle Greaves, Hatton, Peterhead, with three-year-old heifer Connachat 6 of Richmondhill, by Charles of Richmondhill. British Blue – James Manson, Upper Northfield Hempriggs, Wick, with home-bred three-year-old heifer, Caithness Krystal, by Drift Domino. Champion here last year and at last week’s Black Isle show. Reserve – Garry Patterson, Upper Forgie, Aultmore, Keith, with Woodend Logan, an 18-month-old bull, by Attribut Du Fond De Bois. Bought as a calf at foot with his dam in Carlisle for £6,800. Champion at Keith last year and destined for the Carlisle sale in January. Also junior bull interbreed champion at the show. Cross-bred – Moir Livestock, Home Farm, Cairness, Fraserburgh, with Magic Mojo, a 14-month-old heifer by British Blue sire, Empire D’Ochain. Blue cross champion at the Highland, and reserve at the Spring Show. Reserve – Rebecca Stuart and Blair Duffton, Insch and Huntly, with Shaniqua, a 20-month-old Limousin cross heifer, by Lodge Hamlet. Interbreed champion at Fettercairn, the Black Isle and Banchory, champion and reserve interbreed at Echt and champion at New Deer. Holstein – Gordon and Alison Taylor and family, Scott, Craig and Gail, Upper Braikley, Methlick, Ellon, with Braiklay Goldmine Mary, a home-bred three-year-old calved heifer by Hydaways Goldmine. Reserve – Gordon and Alison Taylor with Drum Swift, a third calver by Deveronside Chicharito. Bought at Drum dispersal. Any other breed cattle – Michael Durno, Auchorachan, Glenlivet, Ballindalloch, with 16-month-old Salers bull Cleuchhead Munro, by Cuil Godfather. Reserve – Ian Skea, Correen Dalriach, Kemnay, Inverurie with three-year-old Hereford bull Bennachie 1 Masterman, by Panmure 1 Herman. Champion at Echt. Suffolk – Craig Paterson, Cranna Bridge, Aberchirder, with a gimmer, by Limestone Legend, purchased at the Classic from Birness after standing reserve champion. Reserve – JA Lorimer, Cadgerford, Kingswells, Aberdeen with a home-bred two-crop ewe by Ballynacannon. She was champion at Fettercairn last year. Bluefaced Leicester, crossing type – CR and ES Millican, Newton of Hassiewells, Rothienorman, with a home-bred gimmer by the J22 Riddings tup. Reserve – Sandy Hunter, Wedderburn, Huntly, with a three-crop home-bred ewe by a Tanhouse sire. Bluefaced Leicester, traditional – M Seed and Son, Home Farm, Auchry, Cuminestown Turriff, with Auchry J34, a one-crop ewe by Myfynan Hi. Champion here as a ewe lamb and reserve at Black isle and Turriff last year. Reserve – M Seed and Son with Auchry L1, a tup lamb by Burndale K1. He is destined for Kelso. Texel – Willie Knox, Mid Haddo, Fyvie, Turriff, with a home-bred two-crop ewe by Cowal Vogue. She was champion of champions at New Deer and interbreed champion at Turriff as a gimmer. Reserve – Robbie Wilson, North Dorlaithers, Turriff, with a home-bred tup lamb by Greenstar Alfie and out of a ewe that is an ET sister to last year’s Royal Highland champion. Charollais – Willie and Carole Ingram, Logie Durno, Pitcaple, with Loanhead Riverdance, a ewe by Crogham Hannibal. Champion at the Highland, Angus and Black Isle. Reserve – Eilidh and Erin Duncan, Barnyards, Clola, Peterhead, with a home-bred ewe lamb by Loanhead Single Malt. Reserve at New Deer, Echt and Black Isle. Beltex – Stuart Wood, Woolhillock, Skene, Westhill, with a gimmer which he had imported last year as a lamb, alongside her mother. 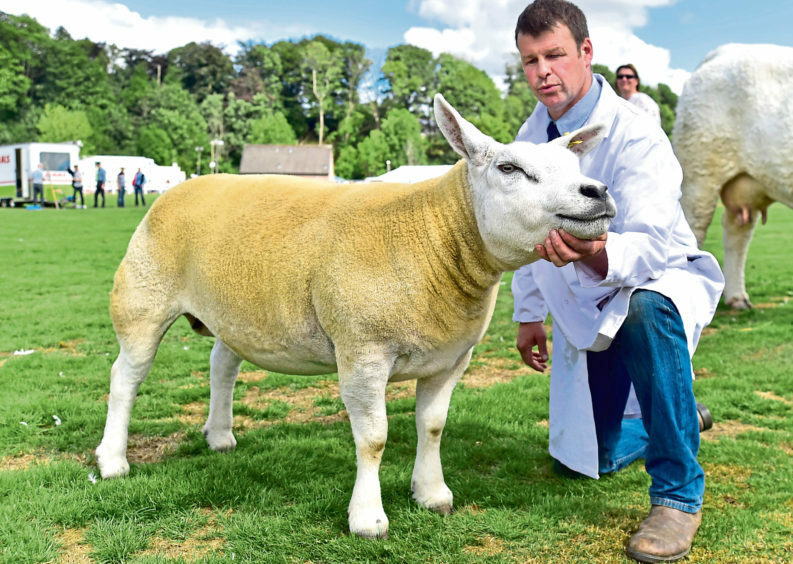 Reserve – Stuart Wood with a two-shear home-bred tup that had been male champion at Echt. Zwartbles – Faye Wilkie, Whitestone Farm, Skene, Westhill, with Whitestone Emerald, a gimmer by Speyside Buzz. Reserve at the Scottish National at New Deer. Reserve – Faye Wilkie with shearling up Killymallaght Enigma, by Smiddyhill Caesar. Bought last year at Carlisle. Blackface – R and N Barclay, South Road, Insch, with a tup lamb by a £32,000 Dalchirla and out of a bought-in ewe. Reserve – R and N Barclay with a one-crop ewe by a £38,000 Auchloy sire. Ryeland – E and K Simmons, Ruthven Farm, Kirkmichael, Ballindalloch, with a home-bred white ewe lamb, Ruthven Yasmin, by Willside Uncle Donny. Reserve – Raymond and Beth Aitken, Beech Cottage, Newton of Fetternear, with Fetternear Viking, a home-bred white three-shear tup.It was champion the past two years at Turriff. Bleu du Maine – Laine Daff, Uplawmoor, Renfrewshire, with a gimmer named Greenside Posh Bleu, by Tighnahinch Massey. She has seven championships to her name, including the Great Yorkshire and Royal Welsh. Reserve – Colin Mair and Partners, Muirfield, Everton of Auchry, Cuminestown, with a ewe. Small and horned minority breeds – Lois Thompson and John Graham, Upperthird Croft, Rothienorman, with a home-bred coloured Shetland tup lamb by Rosebank Ragno. Reserve – Neil Robson, Loanhead Croft, Cairnie, Huntly, with Loanhead Yara, a home-bred Black Welsh Mountain gimmer by the Welsh-bred Teilo. She stood champion at New Deer. Cross pens – Nicol Dow, Upper Sauchen, Inverurie, with a pen of three Down X lambs, by a tup that was bred by Gordon Troup, Whitestone and out of home-bred Texel cross Bluefaced Leicester ewes. Reserve – Moir livestock with a Texel X ewe and two lambs sired by a Culsh Beltex tup bought in Carlisle. Champion at Angus and New Deer. Cross singles – I and H Anderson, Newton of Carnousie, Forglen, Turriff with a home-bred Texel X gimmer by a home-bred tup. Reserve – Sandy Hunter, Wedderburn, Huntly, with a home-bred Mule ewe lamb. Any other breed sheep acc – Stasa Moyse, Woolhillock, Skene, Westhill, with a one-crop Blue Texel ewe by Hackney Excel. Reserve – Stasa Moyse with a ewe lamb out of the champion, and by Hackney Your Joking. Any other sheep breed non-acc – Harry Sleigh, St Johns Wells, Fyvie, with a Cheviot gimmer, by Sebay Superstar, bought as a ewe lamb from Will Campbell, Caithness. Reserve – Grant and Wright, Innergellie House Kilrenny, Anstruther, with a Border Leicester ewe. Clydesdales – Jim Gibb, Shoemakers Croft, Clola, Mintlaw, with seven-year-old gelding Collessie Full Monty, by Collessie Stepping Stone. Reserve – I Young, Wellheads, Clochan, by Buckie, with yearling filly Arradoul Capella, by Arradoul Balvenie. Highland pony – Gordon and Ann Towns, Easdale, Markethill, Turriff, with yearling filly Anya May of Forglen, by Oliver of Forglen. Reserve – Shona Halford, Muirside Steading, Brodie, with Gaolean of Croila, a six-year-old by Danny Boy of Croila. 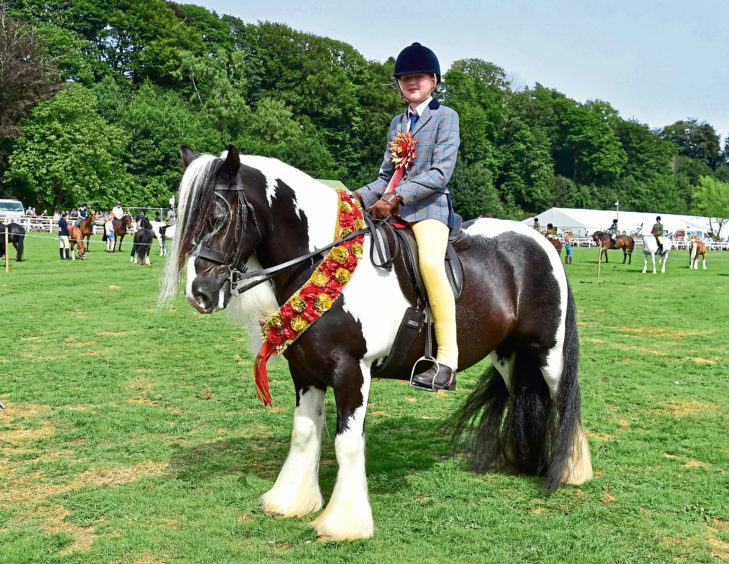 Shetland miniature – Lisa Wilson, Leys Farm, Muckhart, Dollar, with Myreton Dougal, an eight-year-old by Myreton Talisman. Reserve – Ann Irvine, Kininvie, Rothienorman with Moon Shadow of Ore, by Rocky of Haybrake. Shetland standard – Sarah Ross, Whistlemount, Dollar, with Charlotte of Transy, by Earnbrig Ragnor. Reserve – Harry Sleigh with Wells McCoy, by Stow Review.